Enjoy a great deal of aroma, scents and taste inspired more by natural key lime flavor. A few drops turn your favorite creation into a rich tropical experience. Go tropical tonight with a taste of natural key lime in pastries, jams, marinates and an assortment of baked treats. (Please Note: Flavor is highly concentrated (Shake well before use). Type: Key Lime All Natural Water Soluble Flavoring. Ingredients: Natural Flavoring, Ethanol and Propylene Glycol. USP Kosher Grade Flavoring. Usage Rate: 15-20% for E-use. Flavor suitability: Suitable for pastries, jams, marinates, baked treats and candy making. Specific Gravity: .99 No Refunds on Flavoring. 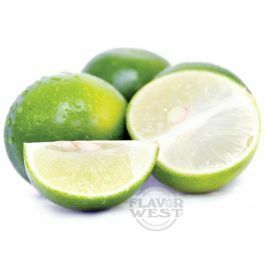 I have only seen one other brand of Key Lime flavor and it does not come close to Flavor West's Key Lime. The lime flavor everyone knows and likes is ok for some flavor mixes, but the magic can come alive with Key Lime. It can really add a new twist to cocktail flavors. Granted, Key Lime can't be used in everything as a regular Persian lime flavor can be, but it sure is fun trying. Flavor West has nailed the Key Lime flavor to a tee.